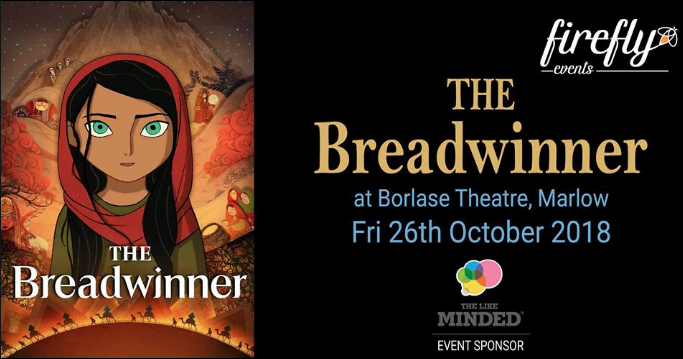 Breadwinner​, introduced by guest speaker Shukria Rezaei ​who will read some of her award-winning poetry, inspired by her own experiences as a young female under the Taliban regime. At MyMarlow, we have been aware of plans for this film club for some time – and excited about the launch. It’s great to have a chance to see highly regarded independent films, that are unlikely to appear at our local larger cinemas, on the big screen. Add in the food and drink options being a world away from multiplex fare, and a carefully selected speaker – it all adds up to what should be a great night, and the perfect launch of Firefly Film Club! 11-year old Parvana, who lives under Taliban rule in Afghanistan. After the wrongful arrest of her father, Parvana cuts off her hair and dresses like a boy to support her family. She soon discovers a new world of freedom and danger and embarks on an epic quest to find her father and reunite her family. “stunning visuals are matched by a story that dares to confront sobering real-life issues with uncommon – and richly rewarding – honesty.” (Rotten Tomatoes). The film is from Cartoon Saloon, an Irish animation studio which created the wonderful, and indeed Oscar-nominated “Song of the Sea”, which MyMarlow rates very highly for what it is worth! The guest speaker, Shukria Rezaei​ is a young Afghan refugee who came to the UK at the age of 15, barely speaking English. She went on to win a scholarship to Goldsmiths College in London and has won awards for her poetry. She will open the evening with a reading from some of her published poetry. A truly inspirational speaker, Shukria is the perfect guest and introduction to such a topical film. movie-goers to enjoy a drink from the bar and choose the best seats in the house. The Spicy Girls Marlow​ will be preparing a chicken and a veggie curry to serve at the screening – this must be ordered in advance (www.fireflyevents.co.uk/whats-on) and will be served before the film starts (around 7:30pm). family ticket (two adults and two children) is £30, adult tickets are £10 each, children (under 17 years) and student tickets are £8 each. To include a chicken or veggie curry into the ticket price, it’s another £7 or £6.50 as appropriate. father and his 13-year old daughter who have lived off the grid for years.